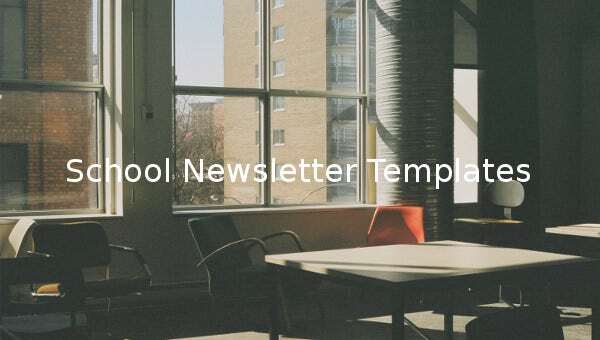 7+ School Newsletter Templates – Free Sample, Example, Format Download! Schools often send newsletters to parents informing them about the different events to be organized by the school. It could be some special function involving large number of students or a picnic where the students need to get parental permission. 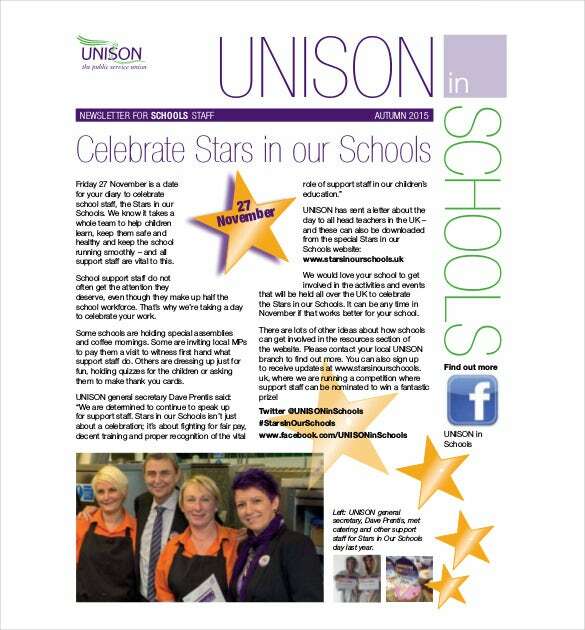 There are classroom newsletter template that help the schools to draft the newsletters in no time. These newsletters are sent on a monthly basis or during some special occasions. 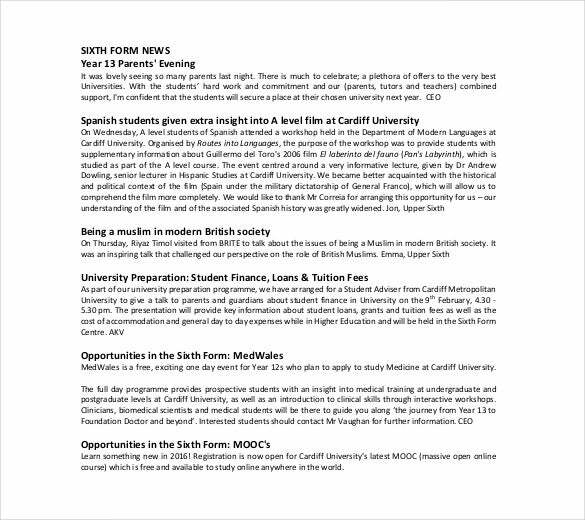 The school newsletter templates Word are an important means of communication between the institution and parents. It helps the parents to stay notified on the happenings in the school. 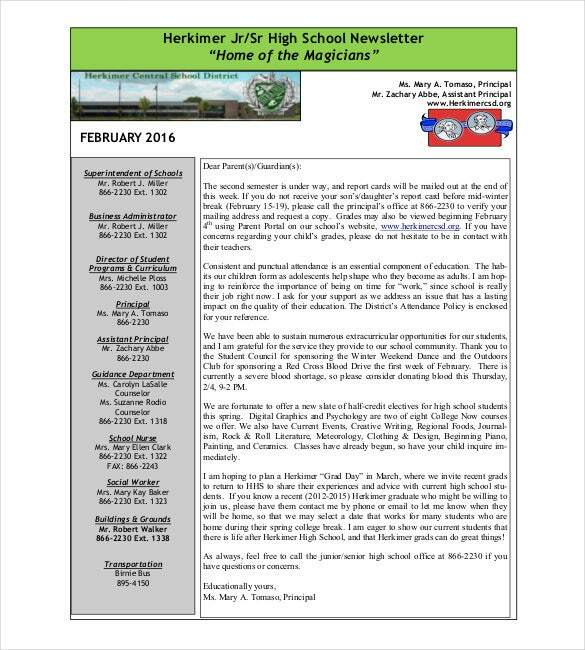 In the current digital age, the newsletter templates are mostly sent to parents’ email ids. 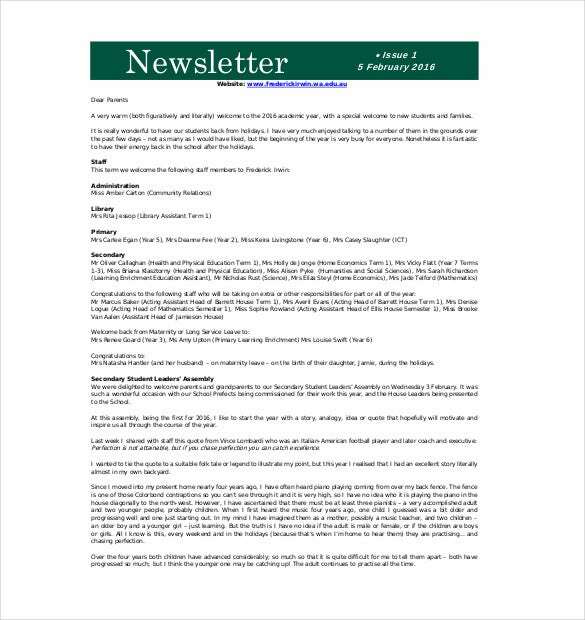 frederickirwin.wa.edu.au | Primary newsletter template has a very catchy design with green header to add important details about the school and a very formal format with intuitive content in each subheading to help you. cathedral-school.co.uk | Cardinia primary school newsletter template free download will ensure that your school informs parents as well as teaches students with intended content in a catchy newsletter format. It comes with examples to help you get idea on the content and context. 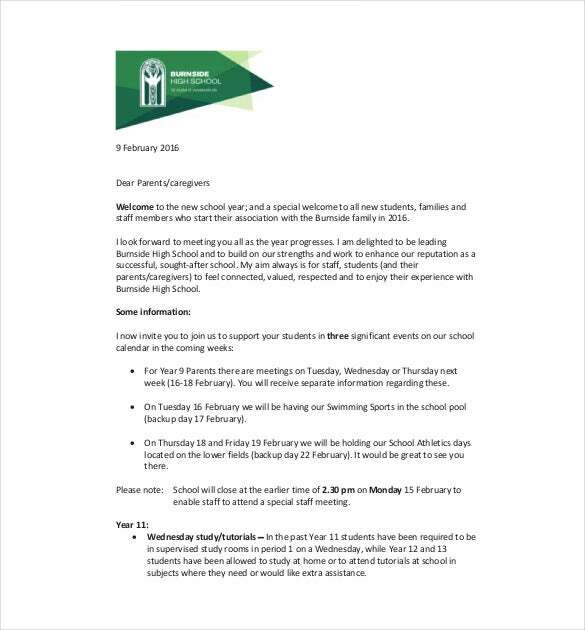 learn.burnside.school.nz | High school newsletter template sample is specifically useful for informing parents about the performance of their kids. It comes with a sample letter to parents and intuitive examples in various blocks. herkimercsd.org | Autumn schools newsletter template free download is an effective way to notify important occasions and events in an impressive, easy to understand format that also includes graphics and social media sharing tags. 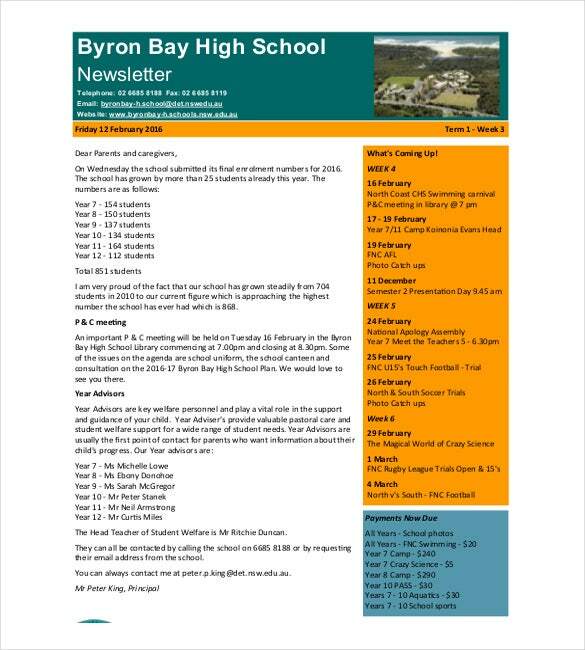 byronbay-h.schools.nsw.edu.au | 2016 school newsletter template sample download is surely one of the best choices for newsletters. It comes with highlighted blocks in several colors to include the details and examples are also provided to help you include the content wisely for each block. williamsvillek12.org | Sample North High School template free download will help you with blocks to specify details like notices from the principle, school heads, administrations etc. which can even be modified for inclusion of preferred subheadings. 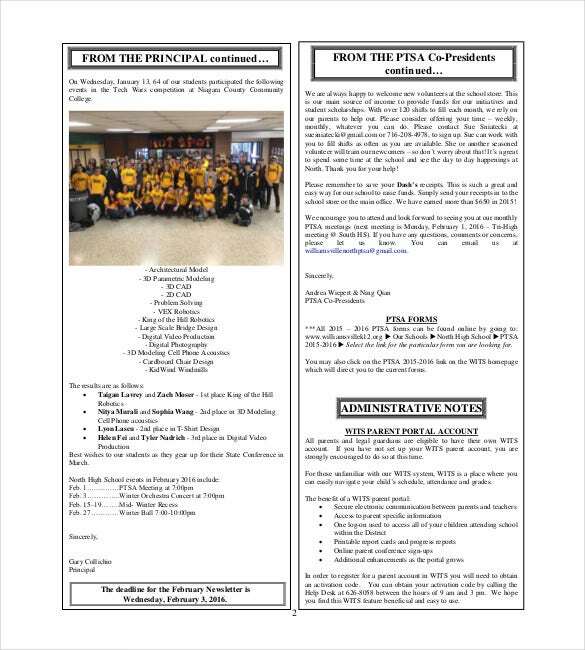 herkimercsd.org | Senior high school newsletter example is designed creatively with highlighted contents and a colorful header on top to include the school name or any other particular. It also has spaces to include logos along with catchy graphics. Download now! 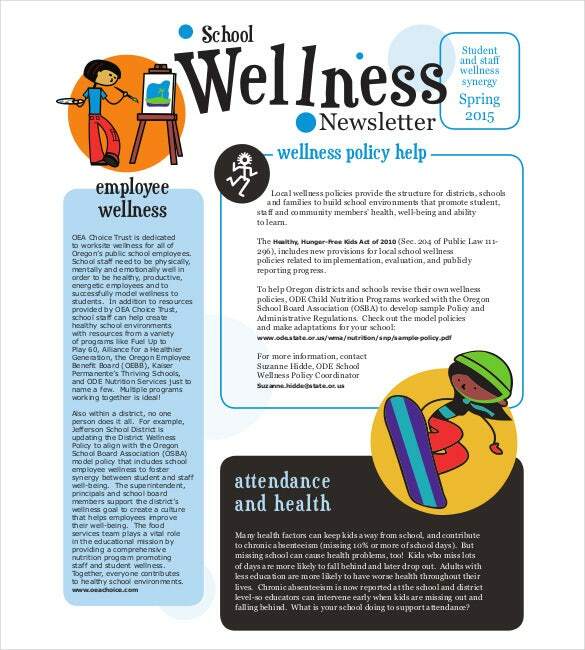 oregondairycouncil.org | Free school wellness newsletter template has a very catchy design with awesome pictures included between different blocks. The use of colors in this template is very effective and highlights important details easily.